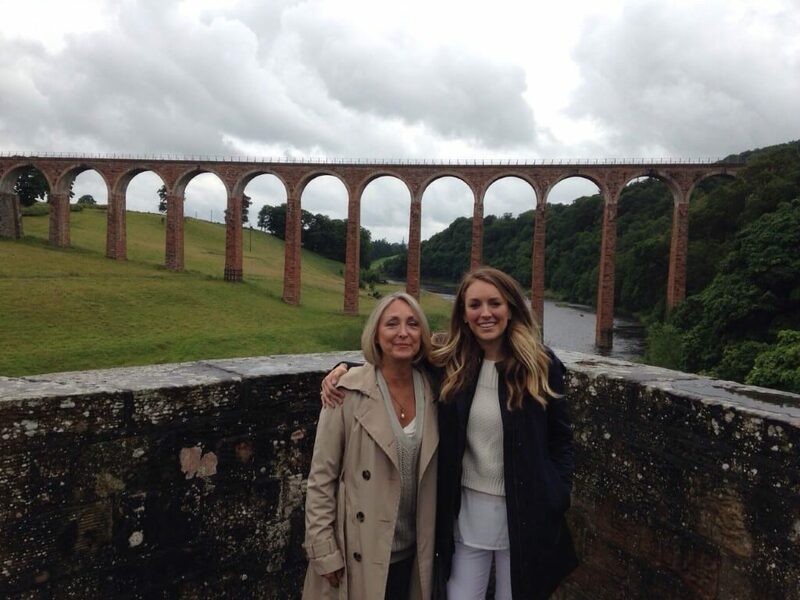 Darlene Wood from Pittsburgh, Pennsylvania in the USA contacted us via email in May 2015 to ask if we would help look into her family history when she and her daughter were visiting Scotland in late July. Darlene had come across our website via Visit Scotland and had got in touch immediately. After a few very positive emails we were lucky enough to speak to Darlene on the phone and a positive relationship was struck up immediately. Darlene informed us that she could trace her Bruce family roots back to various sites in Scotland and asked if we could help fill in some gaps in her knowledge. We researched the Bruce family throughout Southern Scotland and up as far north as Aberdeenshire and shared this information with Darlene and she shared her family tree information with us. We then began to plan a two day draft itinerary which would help give Darlene and her family a lot more information about her family in Scotland and why they and many Scots moved to the Eastern Seaboard and the inland States of the New World. We picked up Darlene and her daughter Lauren at 8am from the fantastic Edinburgh Sheraton Grand Hotel. Very quickly the party bonded easily and settled in for a relaxed 1 hour drive to Moffat. The Woods asked a lot of questions about the scenery, history, culture and politics of Scotland as this was their first visit to our country. 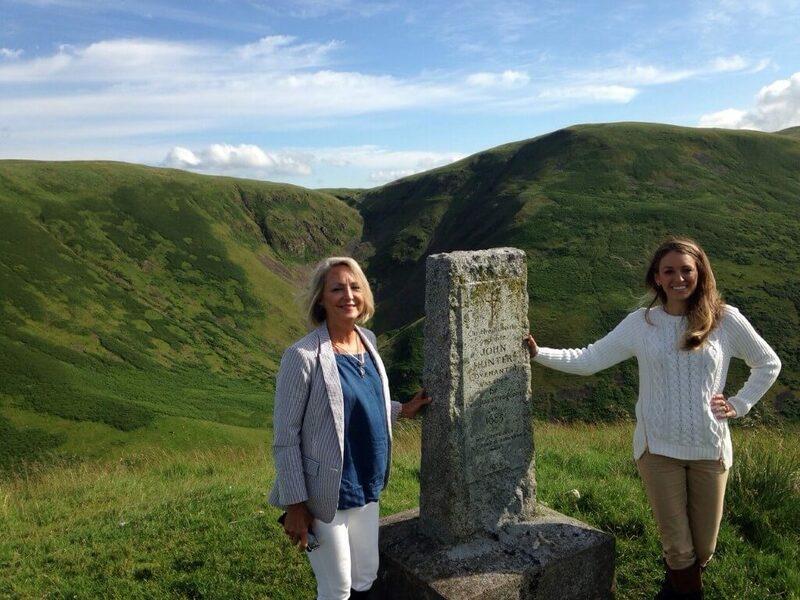 We stopped at the Devils Beef Tub to discuss the significance of this beauty spot and explained the history of the Border Reivers and the Covenanters in the area. We moved on to visit Lochmaben Castle one of the Bruce’s stronghold Castles as the Lord of Annandale. We then spent some time in the town getting lots of pictures of the statue to Bruce in the High St. It was then we realised how important photography was to Lauren as she was taking hundreds of snaps to remember her visit. The weather was staying dry despite a typical 2015 Scottish weather forecast. By 11.00 we had come into Dumfries and visited two sites. Firstly to the site of Greyfriars where Bruce killed John Comyn in 1306 then to Castledykes where Bruce took the motte and bailey castle as he began his campaign for the Scottish throne. Darlene and Lauren were delighted to see these sites if a little taken aback by Robert’s slaying of John Comyn in the Catholic Abbey and the impact this had with Rome during Bruce’s 23 years as King. Before we crossed the Nith into Galloway it was becoming clear In our chat with Darlene that she had an interest in Geology so we fitted in a visit to the 12 Apostles Stone Circle. We do try and include this visit on most of our local tours as it is the largest stone circle in mainland Scotland and deserves to have more visitors. Next on the Itinerary was the evocative Sweetheart Abbey a 13th Century Cistercian monastery founded by Dervorguilla of Galloway in memory of her husband John de Balliol. His embalmed heart, in a casket of ivory and silver, was buried alongside her when she died and their son, also John, became King of Scotland but his reign was tragic and short. The weather had got slightly damp but Darlene was clearly moved by the story and the beautiful ruins of this Cistercian Abbey. Darlene had checked out the afternoon teas online that the Abbey Cottage in New Abbey provided and they were not disappointed by the service and the quality of the food that they ordered especially the Shortbread Sundae. First stop after lunch was a visit to the magnificent island stronghold of the Douglas family at Threave Castle. The Woods loved the stories of the loyalty of the Douglas family to the Bruces’ and loved the names such as Black Douglas and Archibald the Grimm. They loved the short boat journey to the island castle on the River Dee. It was then onto Glentrool in the Galloway Forest Park to Bruce’s Stone to commemorate Robert Bruce’s victory over a much larger English force in April 1307. This place moved both Darlene and Lauren. It was a very emotional stop as we told the story of Bruce in hiding and how he had to use ambush tactics even as King to keep his country independent. Darlene commented on how privileged she was to be at this site overlooking the gorgeous Loch Trool. The Woods were astonished how quiet the site was and were amazed by the beautiful scenery brought about by the backdrop of the Galloway Forest Park. On the way back to the capital city we managed a visit to Comyn’s Tower at Dalswinton set in the fantastic estate. We also explained about the first steam boat journey which took place in the loch on the estate in 1788 and local folklore claims that had Robert Burns, our National Bard, as the first passenger. We travelled through the Dalveen Pass back to Edinburgh. Darlene and Lauren were tired after a long exciting day but as we dropped them off at 8pm after a 12 hour day they were looking forward to our second day with them. We picked up our excited clients at 8 am in Edinburgh for a day which was to have less driving. We travelled to the splendid Melrose Abbey in the Scottish Borders but first we stopped off at Leaderfoot viaduct and the scenic beauty spot of Scott’s View. 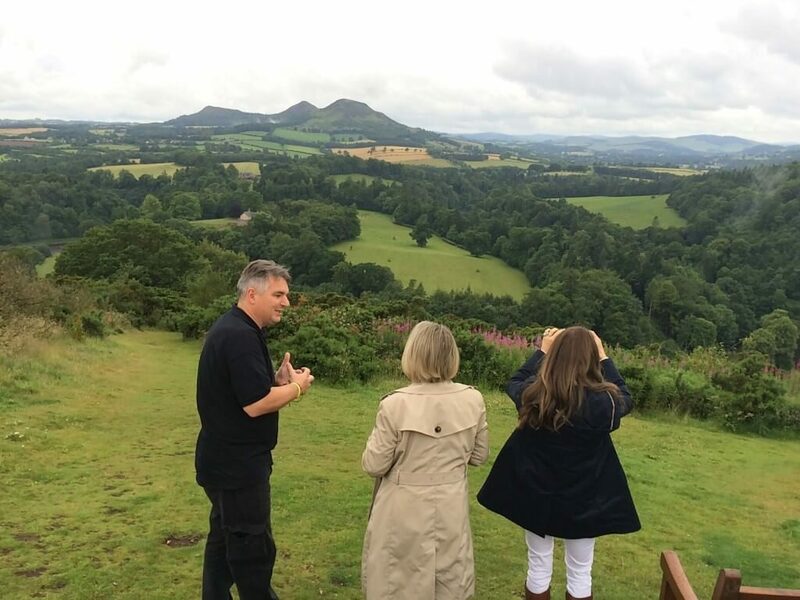 Sir Walter Scott could certainly pick his favourite places and Darlene and Lauren loved the views of the Eildon hills. The visit to the Abbey in a slight drizzle was very emotive as we told the story of Bruce’s heart being carried to the Holy land but never reaching there due to James Douglas getting into a spot of bother at Teba. The family stood over the burial place of Bruce’s heart for a long time after we had finished explaining how the heart was returned to Scotland. The Abbey had many other fantastic tales to tell from buried kings to pigs with bagpipes but it was the site of Bruce’s heart which will live long in the memory of Darlene and Lauren. We then made a quick jaunt up the main roads to Bannockburn for a booking for the 3D show at the Bannockburn Visitor Centre. The centre really is a fantastic place to visit with wonderful staff and both guests were amazed by the quality of the technology on show. They also felt that it was great to be able to handle some of the weapons of the Wars of Independence that we had spoken so passionately about. We went on to lunch at the Westerton Arms in Bridge of Allan which we use regularly as a company. Darlene and Lauren loved the “vibe” of the busy bar and restaurant. 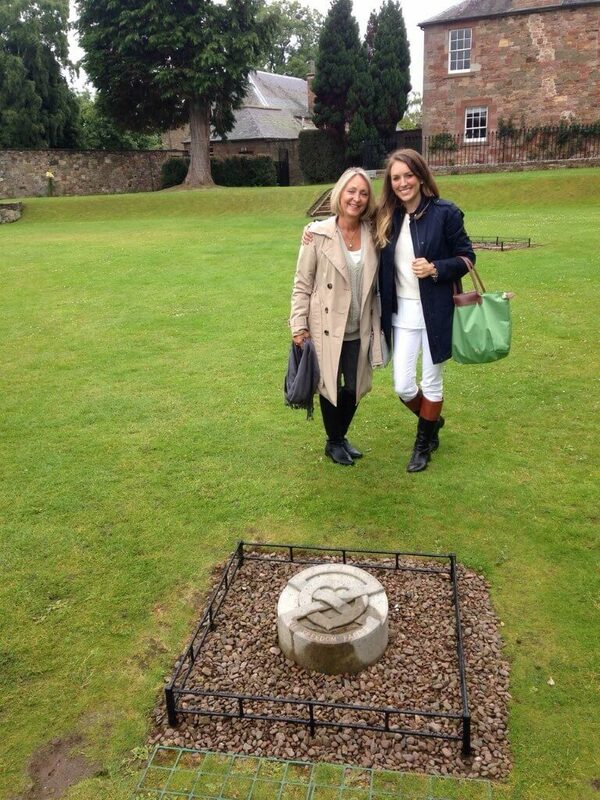 In the rain we then travelled to Dunfermline initially to see Dunfermline Abbey- Burial place of Robert the Bruce but as Darlene and Lauren were from Pittsburgh they were soon to find out that we had some extra stories to tell them. The city of Pittsburgh has so many Scottish connections including the phrases they use but the two most obvious links are those of two of the town’s favourite sons John Forbes and Andrew Carnegie. John Forbes who lived in Pittencrieff Park was a great adventurer and actually named the town of Pittsburgh and is considered to be the founder of the city. Andrew Carnegie moved from Dunfermline to Pennsylvania to become one of the USA’s greatest entrepreneurial success stories. They loved the fact that Carnegie would have been kicked out of the park by the Forbes family and that later on Carnegie bought the park for the town of Dunfermline. We spent some time in the Abbey and Church visiting the burial place of Robert the Bruce (minus heart) and were given some fantastic information by the staff at the church and the Palace across the road. We returned to Edinburgh via the iconic Forth Bridges and the pair loved the views they got as the traffic had slowed down our progress slightly. We arrived back in the city and Lesley advised Darlene and Lauren the best place for Dinner and Cocktails to celebrate their fantastic adventure with us. The Woods eulogised about the sites they had visited and the sights they had seen. 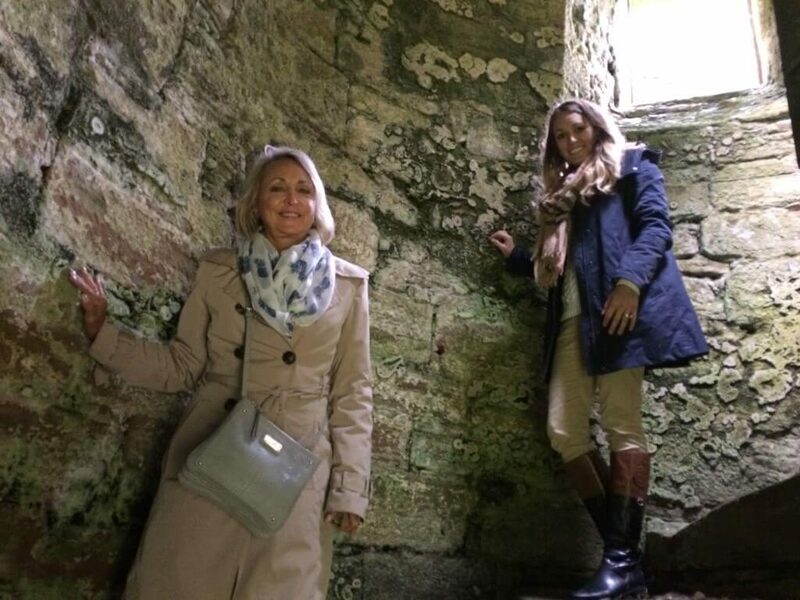 It was a wonderful few days for Solway Tours and for the mother and daughter pair as they traced their Bruce family roots. Darlene has kindly written us her version of the trip below. 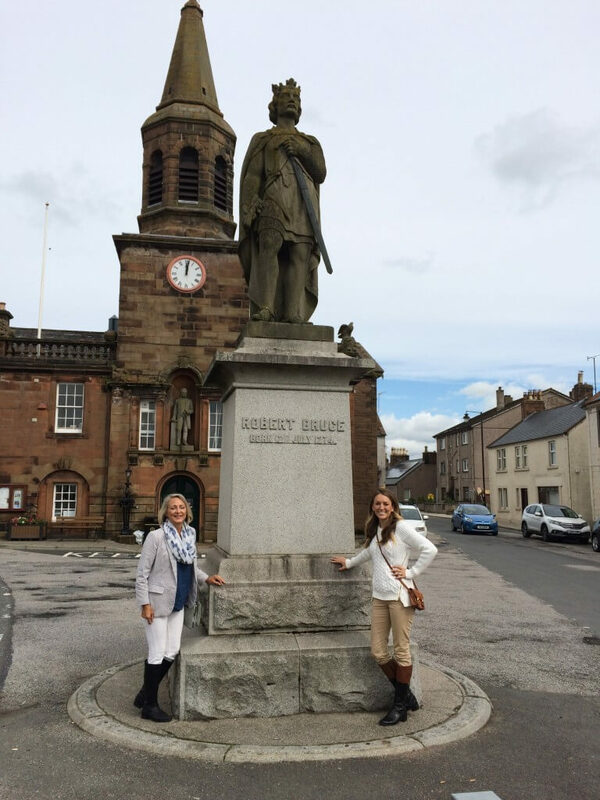 My trip to Scotland with my daughter Lauren was probably the best vacation of my life, and it was largely due to Solway Tours. 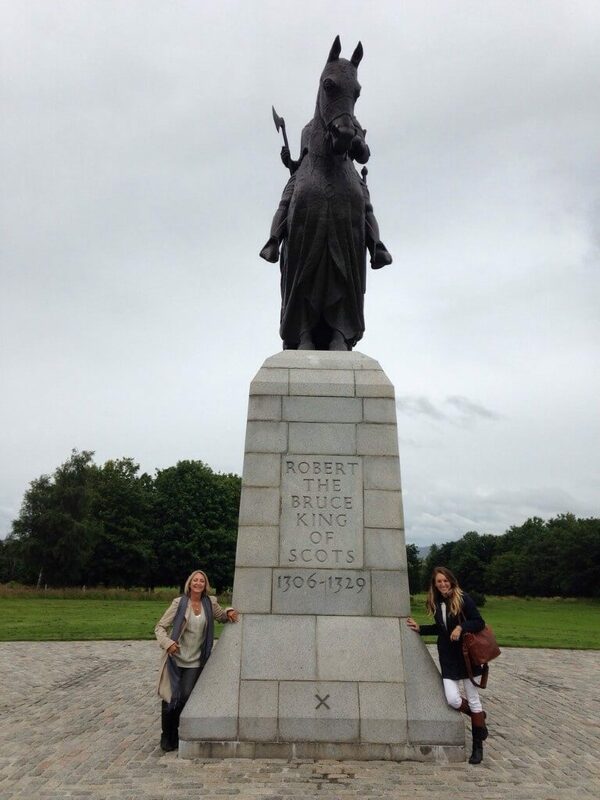 Lauren descends on her father’s side from the great Scottish king, Robert the Bruce, and I wanted her to develop an appreciation of her heritage. I found Solway Tours in checking the advertised historical tour providers on the Visit Scotland website, and was attracted to them in that they offered private, individually designed tours, and door-to-door service by two people who had been history teachers. I scheduled two full days visiting sites in the Scottish countryside, and boy, did they deliver! As promised, they picked us up at our hotel in Edinburgh, and we were on our way to extremely pleasant days of interesting conversation, worry-free visits to important Bruce sites, and back in time for other evening pursuits. Their knowledge of history enabled us to contour our days around the most important locations related to the king, and I came away feeling that I knew as much about Bruce as anyone should. We were even taken to out-of-the way sites that were beautiful in their remoteness, yet critical to the Bruce history, like Bruce’s Stone Glentrool and Dalswinton Castle. Anything else important or interesting along the way, unrelated but important to the history and culture of Scotland was pointed out and even stopped at for photos. 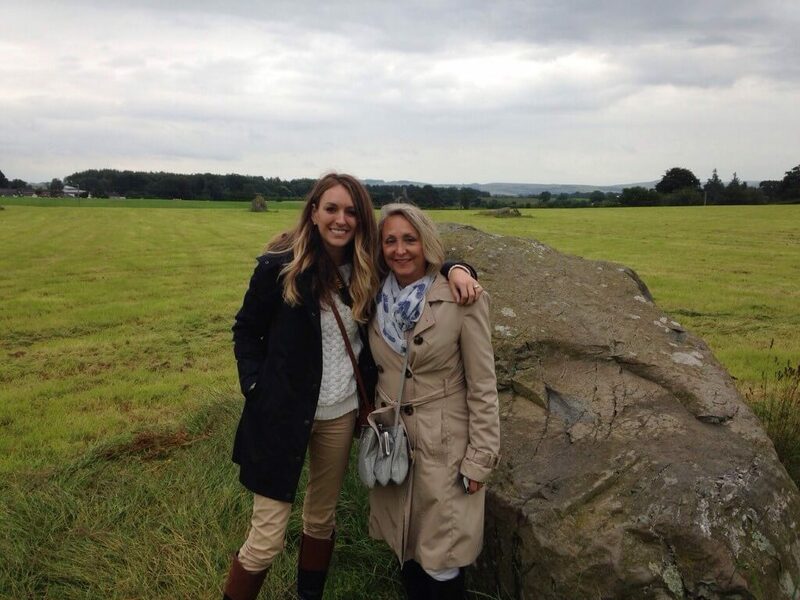 For example, we stopped at a largely unknown, ancient site at the 12 Apostles in Dumfries. This is the largest Stone Circle in mainland Scotland and is part of a much bigger Neolithic site we were informed. We also saw where Scottish salmon fishing was happening, with the iconic Scottish ghillie in attendance. I never dreamed I’d see the town of Lockerbie, but there we were. Not only were Mark and Lesley extremely knowledgeable about Scottish history and almost anything else we wanted to know, they were extremely easy to be with. They are absolutely great with people, and are just born to do this. I was also impressed with Mark’s technical knowledge about other fields, like botany and geology, as if he had just turned in his thesis the day before. Lesley clearly knew her stuff about Bruce and many other aspects of Scottish history and culture. If they didn’t have an answer, they promised to research the answer and get back to us, and they always did! We did so much, we lost track, and they were kind enough to give us a summary of everything we did, along with an interactive map! Again, they met our expectations, and way beyond. I completely and whole-heartedly recommend Solway Tours to anyone wishing for worry-free days and knowledgeable tour guides. Solway Tours- Finalists in Visit Scotland National Thistle Awards! 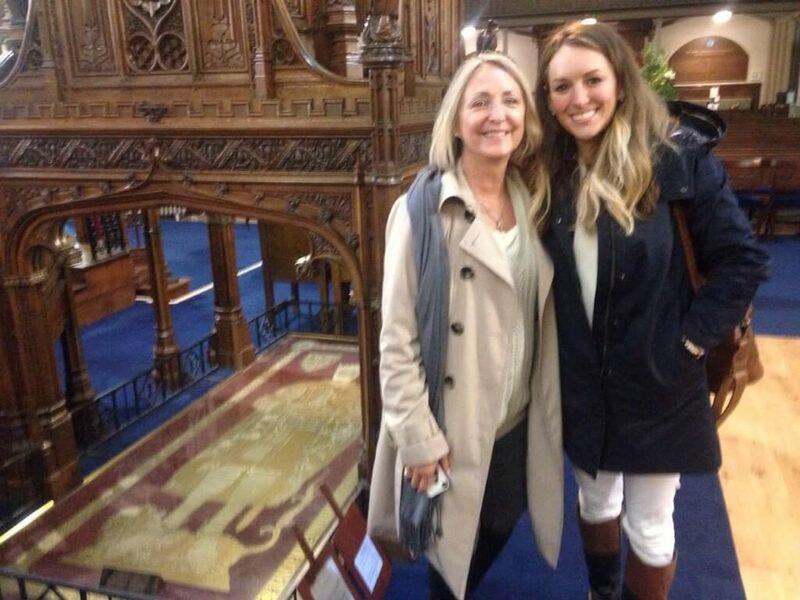 7 Tips for a successful ancestral tour of Scotland!